Misc: 3 BR, 3 BA Resort Property with 1,235 sq. ft.
Orange Beach Condo for sale at Harbour Place – situated in a beachfront development, this east corner, gulf-front residence is nicely furnished, well maintained and rent-ready! The condo had the A/C replaced on ‘17, all appliances (except dishwasher) was replaced with the in last 1.5 years, hot water heater replaced in ’16. This condominium home is priced to sell – community amenities feature a hot-tub, indoor/outdoor pools, BBQ grills, & more. Orange Beach is a coastal community situated between Gulf Shores and Perdido Key, and boosts the largest charter-fishing fleet in the Gulf of Mexico. Orange Beach has miles of white-sand beaches and numerous public parks, the inland bays and bayous just north of Perdido Pass – the subtropical climate allows for ample water-sports and outdoor activities. 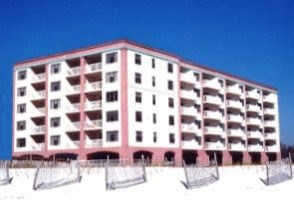 The post Harbour Place Condo For Sale in Orange Beach AL appeared first on USBeaches.net.